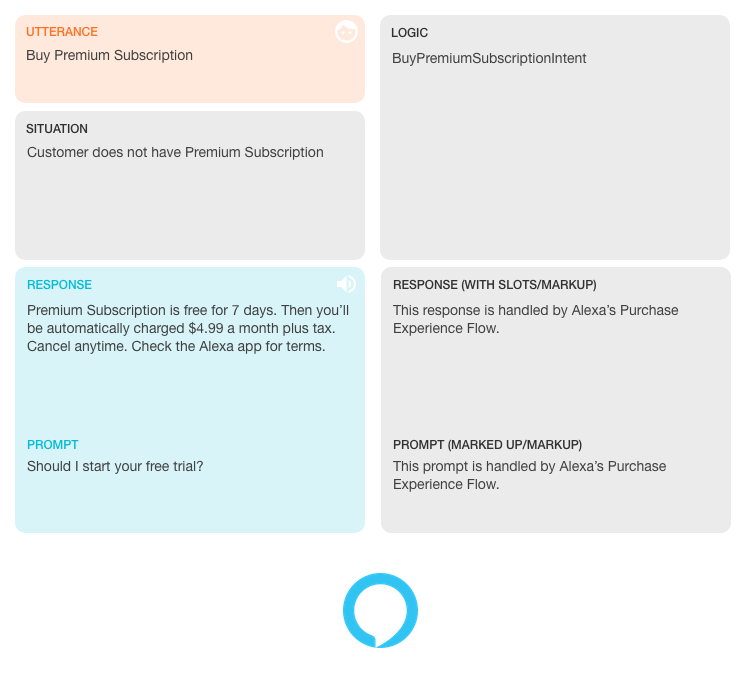 Editor's Note: In our code deep dive series, we provide an end-to-end walkthrough of how to implement in-skill purchasing (ISP) in your Alexa skill. We use the Premium Hello World Skill (available on GitHub), which is a sample skill that demonstrates how to use ISP features by offering a “Premium Greeting Pack” that greets the customer in a variety of languages like French, Spanish, Hindi, and more. We will explain each line of code as we walk through several scenarios that monetized skills should be able to handle. If you'd like, you can follow along by referencing the steps in the GitHub guide to set up the Premium Hello World skill on your developer account. In the previous blog post, we added an entitlement to our Premium Hello World Skill. In today’s post, we will extend our Premium Hello World Skill, and add a new subscription-based in-skill product to it. Subscriptions offer access to premium content or features for a period of time. Customers are charged on a recurring basis until they cancel their subscription. 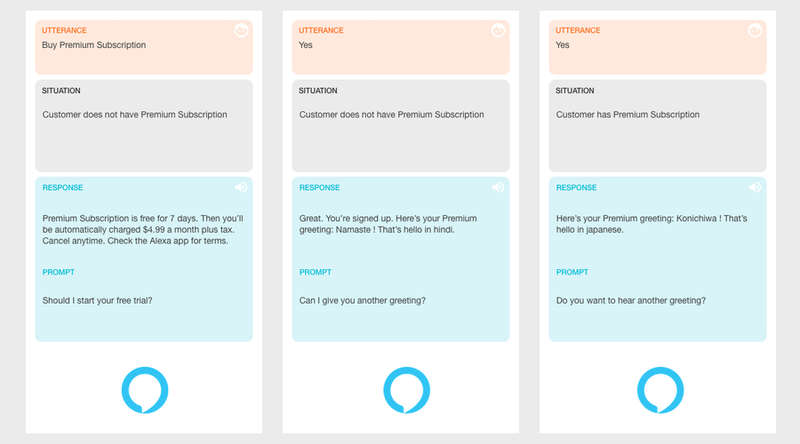 The premium subscription for our sample skill will be a monthly subscription that will greet the customers in native accents using Amazon Polly. Additionally, this will include the functionality for the Greeting Pack, which was an entitlement we added to our skill in the previous post. 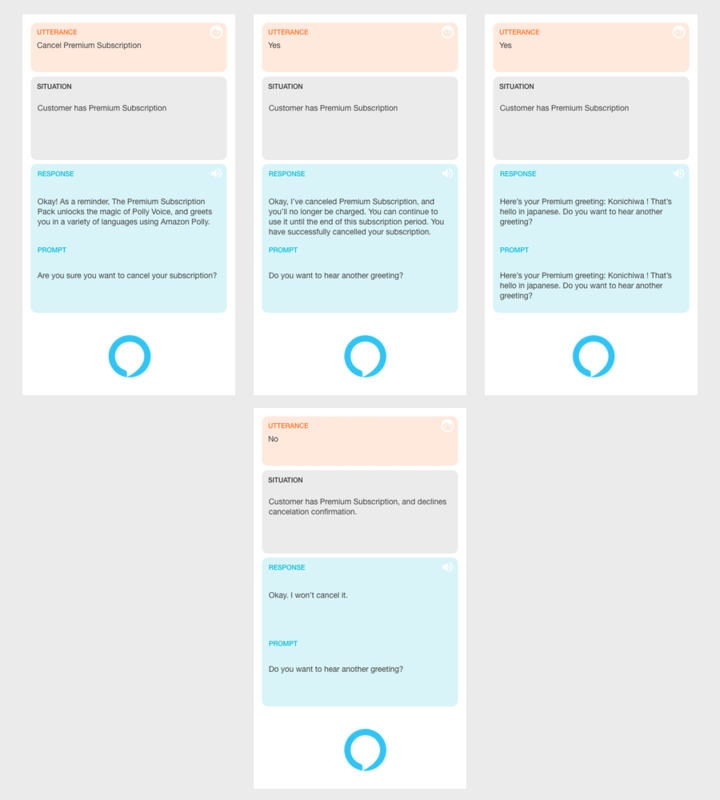 So, at the end of this post, our skill will have two products to offer - a Greeting Pack ($0.99) - greets customers in multiple languages, and a Premium Subscription ($2.99 per month) that will greet the customers in multiple languages using an Amazon Polly voice. Let’s begin! Here are the four scenarios we will cover in this post as it relates to in-skill subscriptions. Be sure to check the certification guidelines which are required for skill publication. In addition, check out these best ISP practices which, though not required, will make your skill eligible for Amazon promotion. 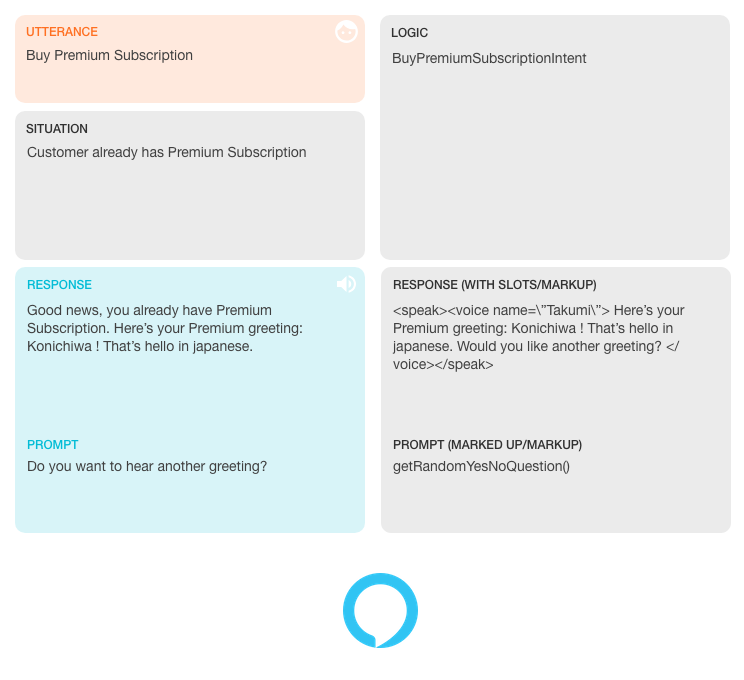 In this scenario, the customer has not bought the premium subscription, and expresses interest in buying it by saying, “Buy Premium Subscription.” This utterance is mapped to the intent BuyPremiumSubscriptionIntent, and the handler BuyPremiumSubscriptionIntentHandlergets triggered in our Lambda code. Inside the handleblock, we call the Alexa Monetization API, which returns the list of products available for the skill in the given locale. Next, we filter this list of products available for purchase to find the product with the reference name "PremiumSubscription”. record => record.referenceName === "Premium_Subscription"
Next, the customer responds with a “Yes” to begin the free trial, at which point, we serve the greetings using Amazon Polly. To serve the “Premium Subscription” functionality, we call the getResponseBasedOnAccessType() function from our BuyResponseHandler To do this, we create a few helper functions that will help us switch to a Polly voice that matches the language of the greeting we serve. Update our getResponseBasedOnAccessType() helper function to include the logic for the subscription product. Create a helper function called getVoiceTalentToSay() that intercepts the speechText and adds the Polly SSML to it, before it’s sent back to Alexa. Create getVoicePersonality() helper function to find an Amazon Polly personality for a specific language. Here’s a complete list of Amazon Polly voices you can use in your skill. Like Scenario 1, this request is mapped to BuyPremiumSubscriptionIntent, and our code in BuyPremiumSubscriptionIntentHandler sends a Connections.SendRequest directive to Alexa. Since Alexa keeps track of the products the customer has bought, it responds back with a “you don’t have any active subscriptions” message. // Filter the list of products available for purchase to find the product with the reference name "Premium_Subscription"
We create a new Intent called CancelPremiumSubscriptionIntent, that handles utterances like “Cancel Subscription”, “Cancel Premium Subscription” etc. The functionality for this intents handled by CancelPremiumSubscriptionIntentHandler in our Lambda code. At this point, the customer can either respond with a “Yes” to confirm cancelation (ACCEPTED), or a “No” to withdraw the cancelation (DECLINED). We handle both these situations in our CancelProductResponseHandler, by checking the value of purchaseResult in the payload sent back to our skill. //The cancelation confirmation response is handled by Alexa's Purchase Experience Flow. //The "No subscription to cancel" response is handled by Alexa's Purchase Experience Flow. Like Scenario 3, this request is mapped to CancelPremiumSubscriptionIntent, and our code in CancelPremiumSubscriptionIntentHandler sends a Connecions.SendRequest directive to Alexa. Since Alexa keeps track of the products the customer has bought, it responds back with a “you don’t have any active subscriptions” message. We hope you find this new series helpful as you embark on the journey to use ISP to sell premium content in US skills and enrich your Alexa skill experience. 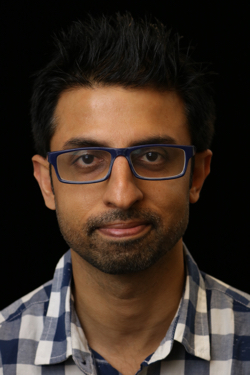 You can reach out to me on Twitter @amit. We can't wait to see what you build!